John Roberts, Beta Gamma 1939, was inducted into the Alpha Chi Sigma Hall of Fame on July 28, 2016 at the 53rd Biennial Conclave. John D. Roberts was born in Los Angeles. He graduated from Los Angeles High School in1936 and the University of California at Los Angeles with an AB (hons) degree in 1941 and the PhD degree in 1944. 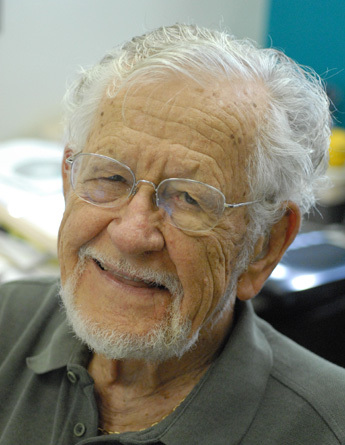 His academic career began in 1945, as an Instructor in Chemistry at UCLA. From 1945 to 1946, he held a National Research Council Fellowship and was Instructor At Harvard. He joined the staff of the Massachusetts Institute of Technology in 1946 as anInstructor, was promoted to Assistant Professor in 1947 and to Associate Professor in 1950. He has twice been a John Simon Guggenheim Fellow. He was Robert N. Noyce Visiting Professor of Science at Grinnell College in 2001. In 1953, Roberts became Professor of Organic Chemistry at the California Institute of Technology; in 1972 he was appointed Institute Professor of Chemistry and, in 1988, Institute Professor of Chemistry, Emeritus and Lecturer. He was Chairman of the Division of Chemistry and Chemical Engineering from 1963 to 1968. From 1980 to 1983, he served the Institute as Vice President, Provost, and Dean of the Faculty. Roberts has been awarded honorary degrees from the University of Münich, Temple University, University of Notre Dame, University of Wales and Scripps Research Institute.Also, he is an honorary alumnus of the California Institute of Technology. He is a member of the American Chemical Society, the American Academy of Arts and Sciences, the American Philosophical Society, and the National Academy of Sciences. He received the ACS Award in Pure Chemistry (1954), the Harrison Howe Award(1957), the 1967 UCLA Alumni Professional Achievement Award in the Field of Science, the Roger Adams Medal in Organic Chemistry (1967), the Nichols Award (1972), the Richard C.Tolman Medal (1975), the Michelson-Morley Award (1972), the James Flack Norris Award(1979), the Linus Pauling Award (1980), the Theodore William Richards Medal (1982), the Willard Gibbs Gold Medal (1983), the American Academy of Achievement Golden Plate Award (1984), the Priestley Medal, the highest award of the American Chemical Society (1987)and the Madison Marshall Award (1989). In 1990, he shared the Robert A. Welch Award in Chemistry with W. v. E. Doering and was awarded the National Medal of Science by President G. H. W. Bush. In 1991, he received the Glenn T. Seaborg Medal, the Service to Chemistry Award of the Orange County Section of the American Chemical Society and an Achievement in Magnetic Resonance Award. He was named as the Caltech SURF 92 Dedicatee for his work with undergraduates in research and received the History Maker Award of 1994 from the Pasadena Historical Society, as well as a 1994 Chemical Pioneer Award of the American Institute of Chemists and the American Chemical Society's 1994 Arthur C. Cope Award. In1998, he was named by Chemical & Chemical Engineering News as one of the 75 most influential chemists in the last 75 years. He received the National Academy of Sciences Award in Chemical Sciences in 1999, the Nakanishi Prize for 2001, the Auburn-Kosolapoff Award in2003, and the Pauling Legacy Award in 2006. He was elected Fellow of the Royal Society of Chemistry in 2008. Recent awards, include, 2009 National Academy of Sciences Award for Chemistry in Service of Society, and in 2009 was elected Fellow of the American Chemical Society. Roberts serves on the Boards of Directors of Organic Syntheses, Inc. and University Science Books. He has been a consultant to the E.I. DuPont Company since 1950. Roberts research has been concerned with the mechanisms of organic reactions, chemistry of smallring compounds, and applications of nuclear magnetic resonance (NMR) spectroscopy,especially of F-19, C-13 and N-15, to organic, bioorganic and biochemistry. His current research encompasses the application of nuclear magnetic resonance (NMR)to conformational analysis, femtosecond chemistry of organic reaction intermediates in collaboration with A. H. Zewail, and theoretical organic chemistry. He is the author, with M.C. Caserio, of Basic Principles of Organic Chemistry (Second Ed., 1977). He has written other textbooks on NMR spectroscopy and more than 500 scientific papers. ACS Books published his autobiography, At the Right Place at the Right Time, in 1990.His textbook, ABCs of FT-NMR, was published in November, 2000.